Given some criticisms of the Harvard School of Public Health led study, published in the New England Journal of Medicine, I thought it useful to compare point estimates and 95% confidence intervals of several extant studies, placed in a time context. Figure 1: Estimates from Santos-Lozada and Jeffrey Howard (Nov. 2017) for September and October, and Nashant Kishore et al. (May 2018) for December 2017 (blue triangles), and Roberto Rivera and Wolfgang Rolke (Feb. 2018) (red square), end-of-month figures, all on log scale. + indicate upper and lower bounds for 95% confidence intervals. Cumulative figure for October author’s calculations based on reported monthly figures. The growth rate of cumulative excess fatalities is in the range of 70% per month. Steven Kopits has characterized the study published in the New England Journal of Medicine as “garbage”, noting that it uses survey data. He has instead relied on Demographic Registry Data in his assessment. He places cumulative excess deaths at 200-400. Interestingly, Rivera and Rolke (2018) also used Demographic Registry Data and concluded that 822 excess deaths occurred from September 20 through October 31 alone, with 95% CI (605, 1039). Extrapolating linearly through end-December (time span conforming to the NEJM article) would imply 2603 excess deaths, well within the 95% confidence interval of 793-8498. 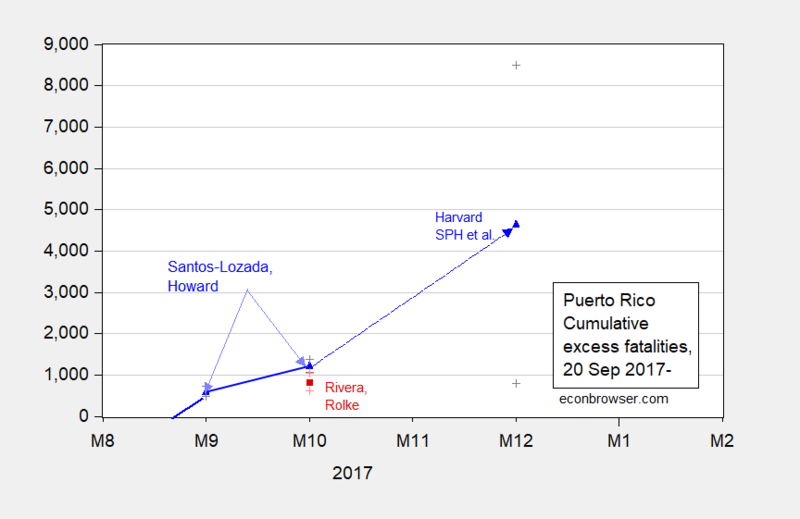 It should be also remarked upon that the Santos-Lozada and Howard study uses actual statistics for baseline from Puerto Rico Vital Statistics System, and cited numbers processed through Puerto Rico Department of Health for September (extrapolated for October). Hence, this estimate is also not survey based. Hence, we have two sets of non-survey based estimates that as of October exceed Mr. Kopits’ upper bound of 400. ” He places cumulative excess deaths at 200-400. Interestingly, Rivera and Rolke (2018) also used Demographic Registry Data and concluded that 822 excess deaths occurred from September 20 through October 31 alone”. I bet the Trumpsters here will argue we should stop the counting at October 31. Why? Any deaths from November 1 onward would be Obama’s fault! Two forces at play here: nature and shoddy building standards. You can’t control the first, but you can control the second. The matchboxes that so many called homes were primed for disaster. The shoddy electrical grid was primed for disaster. The shoddy island government was primed for disaster. So they go disaster. What is to be done? The restoration of Puerto Rico’s power grid is a timely object lesson on the vulnerabilities of modern electrical networks and on the emerging technological options for minimizing those vulnerabilities. Power experts are now not just repairing Puerto Rico’s grid but doing so with an eye toward a future that portends storms of increasing intensity and frequency. Grid operators around the world are considering the merits of microgrids, utility-scale energy storage, and distributed and renewable generation. But for Puerto Rican officials trying to rebuild their shattered electrical infrastructure, these possibilities are of much more than abstract interest. . https://spectrum.ieee.org/energy/policy/rebuilding-puerto-ricos-power-grid-the-inside-story . Just waiting for the next big hurricane to do the same thing. Third, all houses can be rebuilt to withstand hurricanes, but it would probably take all of the resources of FEMA and then some. Meanwhile, Puerto Rico could establish some standards that would greatly ameliorate future damage: https://www.popularmechanics.com/home/interior-projects/how-to/g605/8-ways-to-protect-your-home-against-tornadoes-and-hurricanes/ . Here in Michigan, where tornadoes are uncommon, we still have some of those standards for new construction… especially hurricane clips for roofs (which are on our house built in 2010). If your roof stays on, you and your house might have a better chance of survival. The idea of having Cable-Tite ties to connect the foundation to the top plates would be quite helpful. Those two features are reasonably economical. Could more be done? Possibly, but the logistical reality belies the white paper plans. You need money, of course, but you need the right supplies, the right expertise, the right vision. Simply replacing what was wiped out so easily is a recipe for a second disaster. shoddy building standards? Oh boy – talk about blaming the Puerto Ricans as we need to at all costs excuse the inadequate response from Trump’s government. Bruce – please avoid Puerto Ricans as they are very angry over this. They have every right to be angry but we do not want you to get hurt. LORD! TBTW Bruce – I hope you get that the income per capita on the island of Puerto Rico is less than half the income per capita for the rest of the US. My point is simple – expecting them to have the same building standards of someway say in rich New York City is beyond absurd and incredibly insulting. It was not building standards. It was state-ownership of the power company. When a utility is further in state-ownership, all the bad features are exacerbated. In Puerto Rico, the base electric rate had not be raised since 1989. Without looking, I would guess that employment levels at the utility are 1.5-3x higher than comparable private firms. (Note: The NYT reports that up to half of the employees were the family members of politicians.) Depressed revenues and raised expenses obviously starves the capex budget of the utility. Indeed, the Puerto Rico Electric Power Authority (PREPA) had filed for bankruptcy just last July. (Pretty impressive: A natural monopoly of an essential service filing for bankruptcy.) In any event, after thirty years, the utility was being held together with chewing gum and paper clips, and is highly vulnerable to adverse events like hurricanes. When catastrophe hits, there is no source of repayment for needed repairs. That’s why PREPA signed that shady deal with Whitefish, and still seems to employ some weird firms. I would add that the Federal government appears to be carrying a large portion of the cost of PR power generation and transmission repairs. At the core of the problem, however, is electricity rates that failed to cover needed and anticipated capex, mismanagement under earlier leadership, and a pretty impressive dose of corruption and patronage. not sure if it is fair to punish the average joe in puerto rico for the political malfeasance the island has endured. Race topics are always a touchy/sensitive issue. But what I have found amongst my Asian friends (of whom I have had quite a lot) and just as much or more among my black friends (though honestly I have had relatively few, but still enough to make a gauge) that minorities appreciate when people talk openly and frankly about race, rather than those who out-and-out avoid it. Because a lot of times when people avoid it, it usually means they are hiding something dark, or something generally unacceptable to societal norms. (We’ve seen that with the MAGA people coming up out of the woodworks in Charlottesville etc.) When you are open, even if there can be friction, there’s a straightforwardness to it I think many minorities appreciate—certainly over pretending it’s not an issue. But I’d like to point out something. How many non-hispanic whites (that seems to be a debated issue in some sense, maybe because hispanics can often “pass” as white, others can debate that) are doing academic research on this topic?? Even in the ones Menzie sites above seems you see at least one hispanic co-writing the paper. We’ve mentioned Setser before and I don’t think he’s hispanic. I wager Setser is the exception and not the rule. My long-winded way of making a simple point here is…… There are some Asians who would get extremely upset if Taiwan was left blowing in the wind during some catastrophe (YES, I know the difference that Taiwan is not an American territory, but for some of you idiots I have to make that parenthetical expression), but not even give Puerto Rico the amount of thought it takes them to take one sip of coffee. Some people walk-the-walk and some people talk-the-talk when it comes to equality and how much weight they put on the issue in their lives and work. Menzie walks the walk. Menzie, Steven’s article made this estimate: “deaths reported by the registry were up 654 for the period covered by the MPR Study.” His estimate was based upon actual deaths reported. All studies establish a baseline number to define expected levels. All studies used reasonable approaches to estimate excess deaths with just Harvard as the obvious exception. Three of four of the estimates used the available official actual data or estimates there from. The Harvard study did not. Clearly, it is the outlier using least amount of actual data. I side with Steven the Harvard study is garbage. CoRev: I know you will think this is “fake news”, but see this post. Menzie, why fake news? I think you are adding weight to the Puerto Rico Department of Health actual numbers. Even after adding six months of data compared to the other studies your estimate is still less than 1/2 of the Harvard study. corev, do you think maria or katrina produced more deaths? Baffled, I don’t know but think the significant differences in logistics environments makes the comparison difficult at best. Did we count Katrina excess deaths for a year after, or for as long after the hurricane as we as we are doing in PR? Just too many variables to make a precise comparison. simple question, does not need a two step to avoid answering. Baffled, simple question? We still do not definitive estimates for Maria. Even Menzie agrees: “Hence, my view is that contentions that a “firm” count has been achieved within a year of a major and ongoing disaster is unwarranted.” If you look at the Gelman report and its comments you get a feel for the difficulty of identifying cause of death in these occasions. The reason for this cut off date is simple, liability as shown in the report: “To finish the work for Katrina and arrive at a final number will take not only resources, but also courage, Le Melle said. “I believe we fear responsibility,” she said. “When we declare the reasons of death, then suddenly, someone may be liable. … So I understand a resistance to a broad definition of Katrina death. But I think most victims, and families of victims, want to be acknowledged. If you think you have a valid and final number just for Katrina you are kidding yourself, and we are no where the same time frame for Maria and PR estimates. simple question corev. do you think maria or katrina produced more deaths. i am not asking for an explicit number, details or excuses. only which would be larger. which storm event would you expect to have a greater number of deaths? it is not a difficult question. a one word answer would suffice. Baffled, I don’t know! If you still think this is a simple question, then you have completely misunderstood the various articles on the PR/Maria estimates. Why don’t you answer your own question and then let me pick at your preferred and incomplete numbers? Unless you do, I’m done with you. Menzie, nope! Just tired of the baiting. CoRev: I’m just pointing out the logical implications of your argument. That is “baiting”? i ask a simple question and all i get back is drama. funny how corev has no problem complaining about government data presented for climate change or labor rates, when they go against his worldview. but when you ask about government data related to hurricane deaths, he has no desire to discuss the credibility of a possible undercount. i smell somebody driven by a political agenda here. all i was interested in knowing was whether corev thought maria was a more significant event than katrina. and the response was complaining. the party of no! Baffled, as i already explained: ” Just too many variables to make a precise comparison.” So when you ask: “do you think maria or katrina produced more deaths.”, you are asking for precision. What do you actually mean? Are you talking about direct or indirect deaths? Which Katrina death totals do you want to compare? And, to which set of Maria’s preliminary death totals? Are you talking about just US or total area of tracks? For what time frame do you want a comparison? Etc. Claiming a simple question,. when the question is far from simple is baiting. Menzie, “I’m just pointing out the logical implications of your argument.” Are you now denying the import, logical implications, of your own articles and references from which I drew most of my quotes? Why are you piling on to the baiting? You obviously agree that the question is simple. Maybe you can answer Baffled’s questions? I would be extremely petty and shallow to say that it’s really sweet to have “Princeton” Kopits to be shown as the person he truly is in this post. A man who so transparently exposes himself as the pseudo-intellectual he is, and is respected by all of his true peers—>> the one and only peer “Princeton” Kopits has, is the one that he looks at in the mirror. That would be extremely petty of me to say. it’s REALLY SWEEEEET (!!!!) to have “Princeton” Kopits to be shown as the person he truly is in this post. Andrew Gelman has a very interesting article of the NE journal article for any interested parties. it appears to me to be a very simple and straightforward question. if you wanted to qualify your response, fine. but your avoidance of a response certainly seems rather surprising. we know a lot about the storm itself, its path of destruction, etc. knowing this information, which storm do you think would produce more deaths. its simply a sanity test type of question. there is really no right or wrong, per se. when somebody does a calculation, they usually perform a sanity check to see if that result seems reasonable or not. often times comparing the result to other known events. corev, your hemming and hawing is truly baffling. Baffled, remain so. The only insanity is the need to bait by asking questions with no known answer. You have yet to answer your own question, in part or total. How many deaths were there for Katrina? Quit the baiting, you are losing. corev, judging by the wind speed, rain count and local geography, i would have expected maria to be a more significant storm than katrina on the local populations. i do not believe the island of puerto rico had the preparation and recovery options available to those in new orleans. and we saw how the bungled response in new orleans led to unnecessary suffering. so when i see an order of magnitude difference between death counts from katrina and maria, it raises suspicion. your concern for “baiting” smells of paranoia for some reason. Baffled, but what are the estimates? Y’ano the answers to your simple question? in your ranting and huffing and puffing, you apparently lost the ability of reading comprehension. i did not ask you for “the estimates”. i simply asked you which event you think produced more deaths. as i said, a very simple question. why must you insist on making a mountain out of a mole hill? y’ano. Corev, Still waiting for your answer to that simple question. Y’ano, the one I actually asked.